These days, writers don’t have the privilege of just writing. We have to become marketers. And it’s not because we want to stand on street corners handing out flyers and begging people to read our stuff. (Trust me, we don’t.) I’m sure most of us would be more than happy to sit at home creating our worlds and leave all the selling to someone else. But the fact of the matter is that, no matter if you self-publish or go the traditional route, almost all of the marketing is left on the author’s shoulders. Let’s Sell Your First Book focuses on just that. I received an advanced reader copy of the book from the author for free, but I promise I would have paid quite a bit for it! This book is absolutely packed with information. It breaks your marketing down into what strategies you should be using before you start writing, while you’re in the process, once the book is finished, and after it’s published. Don’t think that because you’ve already written a book (or several) that this information isn’t for you. You can easily go back and do everything you didn’t think about or missed out on the first time around. There’s so much information here. Not only does Amrita share her insights on marketing, but she includes links to numerous (and I mean, really, there’s a lot) of other articles on the subject matter. It’s the kind of book you have to read through once, and then go back over with a fine-tooth comb just to make sure you get everything out of it. A writer could spend so much time with this book. I have to admit that there are times I get excited about marketing my books, but they come and go. (We all get in our slumps, right?) 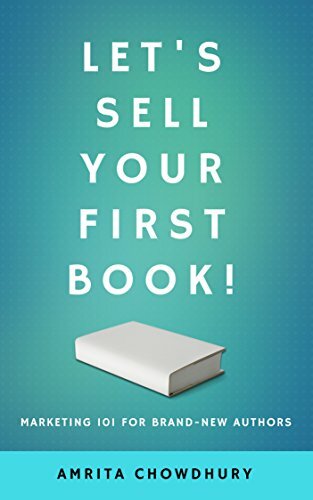 Let’s Sell Your First Book is very inspirational when you don’t feel like working on your social media platform or setting up your email newsletter. I have absolutely no choice but to give this book a 5-star rating. There’s a ton of information, it’s easy to understand and apply, and it’s increased my summer To Do list by about 5000%. You go buy the book, and I’ll be selling mine!